We found 2 results for home care in Enfield, Connecticut. Home healthcare costs in Connecticut range from around $120 to $248 per day, with a mean expenditure running about $176. The monthly cost averages around $5,280 and ranges between $3,600 and $7,440. On a yearly basis, the average cost is about $49,192, which is higher than the national average of $45,188. 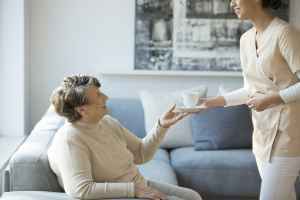 The cost of home healthcare in Enfield typically ranges from as little as $16 per hour up to $31 per hour. The median cost is approximately $22 per hour, or around $49,764 per year. Located in Hartford County, Enfield is a small city in the State of Connecticut. It is part of the Hartford-West Hartford-East Hartford metro statistical area. While the encompassing area is home to 990,086 people, there are 44,654 within the city itself. People who are over 55 represent about 26% of the population. Enfield has a moderate SeniorScore™ of 69. The city has a mean per capita income of $30,000 and a mean household income is $68,000 (the Connecticut state average is $79,000). The median housing price in Enfield is $145,500, which is much lower than the state average of $456,000. The city has an average unemployment rate of approximately 7.65%. Enfield has tolerable average temperatures, with tolerable winters and mildly warm summers. The city gets heavy levels of rain each year. Compared to similarly-sized cities, Enfield has good water quality, very poor air quality, and a lower than average rate of crime.